To honour the 60th anniversary of the Stratocaster in 2014, Fender introduces two brilliant new Limited Edition looks for the venerable Amer..
To honour the 60th anniversary of the Stratocaster in 2014, Fender introduces two brilliant new Limited Edition looks for the venerable American Standard Stratocaster. This beautiful Aztec Gold model features a parchment pickguard and maple fingerboard. All the acclaimed features, sound and style of the archetypal American Standard Stratocaster, now in even more beautiful finish options. Factory Special Run Finish - Limited Edition! Conceived at the USA Fender factory originally in 1954 by Leo Fender himself, the American Stratocaster has left its mark on the music industry and helped shaped the sound of Country, Rock, Blues and Punk, plus countless other genres. Think Jeff Beck, Jimi Hendrix, Ritchie Blackmore and Eric Clapton to name but a few of the legends who famously wielded a Strat in their prime years. Over the years, the Strat has changed very little. Why fix something that isn't broken, right? The sleek, contoured Alder body has defined the tone and playability of the Strat since 1956 and remains today. The trademark 'whammy' tremolo system offers up outrageous string-bending tone without affecting tuning stability. However, modern innovations have helped Fender craft the Strat to perfection. A thinner undercoat finish offers improved resonance, while a copper-infused bridge block further adds to the tone consistency and performance. In the past, the premium Fat 50s single-coil pickups were typically reserved for Fender's top-of-the-line Custom Shop guitars. 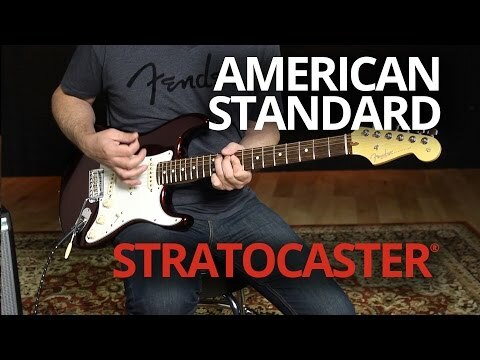 Adding incredible value to the American Standard Strat, these are now fitted as standard, so you get fantastic tone with all the bark and bite that typifies a Stratocaster sound. The latest incarnation of the all-American Fender Standard Strat employs the hand-rolled fingerboard edges that players love. A super smooth neck finish makes fast fretting a dream and offers great accessibility all the way up the fretboard. As with all American-made Fenders, the Standard Stratocaster comes with a hardshell case and all the case candy - Cable, Strap, Polishing Cloth and Trem Arm all included. Everything you need to keep your prized guitar in tip top shape. Nothing quite beats the feeling of unearthing a box-fresh Strat straight from the Factory. Fantastic!